Visit the APA national website to learn more about the benefits of membership and all of the membership options listed below. APA and the Wisconsin chapter offer multiple ways to be involved with other planners in Wisconsin and nationally. Please visit the APA National Membership page to learn more about joining APA national as a planning commissioner, academic, planner working outside of the U.S, an allied professional, or citizen. Discounts on books, conferences, Planning magazine, and connection to a network of other planners who "get" what you do every day. When you sign up as a student member with APA National, you also become a member of your state chapter. Free student memberships bring immediate and long-term benefits--both professional and financial. Join now. Chapter-only memberships are designed to allow professionals in related fields to participate fully in Chapter activities, including governance, discounts on chapter events, and receiving communication from APA - WI related to events, news, and professional development opportunities. Chapter-only membership does not give you membership in the American Planning Association. As a chapter-only affiliate, you will not receive the publications, benefits, and exclusive discounts given to APA members. Chapter-Only Membership due are 20% of the applicable APA national dues. APA - Wisconsin has established a $50 organizational membership. When your organization becomes an organizational member, all of the non-planning staff members that you designate are added to our communication distribution lists. Help keep everyone in your office or local unit of government apprised of current legal issues, professional development opportunities, news in Wisconsin planning, and more. Organizational members are non-voting; all regular and student members employed in the organization continue to enjoy their respective membership rights and benefits. 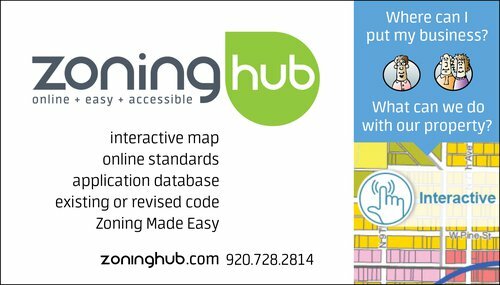 Thank you to one our generous sponsors, Zoning Hub.